ccasionally, this writer visits Christian bookstores and peruses the newly released Bible translations in order to evaluate, not only the readings of several predesignated test verses, but also the maps, tables, cross-references, and various helps for the reader. This experience often results in pleasant discoveries which increases his appreciation of textual resolutions, and further deepens his understanding of the often mystical pathway of interpretation. As this writer investigates several pre-determined test verses, it is with more than twenty-five years of experience in reading, studying, and translating from Greek texts, plus the knowledge gained from the works of published textual authorities. This wealth of knowledge is being freely shared with you in the hope that it will increase your understanding of the differences between translations, and further guide you in the selection of a personal study Bible. In the interest of a balanced comparison, all translations have been sorted according to their literalness, and that literalness has been determined solely by our three prime test verses. The most literal stand at the top and the most interpretative rest near the bottom. This ranking does not infer that one translation is more accurate than another, but only to spatially represent their literal and interpretative differences. Frequently this process becomes challenging, for some interpretative versions may capture the true literal essence of a passage and some literal translations digress into interpretation. Since all translation is a matter of interpretation to some degree, we use this term to mean the infusion of personal opinions which may not necessarily be required by the underlying text. The following sections explain why each verse was selected for this exercise, the predictable meaning-based interpretation, and special cues to alert the reader for otherwise unknown influences which may affect the over all evaluation of a translation. The first reason this verse was chosen is because it demands an almost word-for-word translation with little room for experimentation or imagination. Each word is interpretively rigid, the verb tense does not allow much exploration, and the basic question asked of Jesus expects a simple yes or no answer. A literal sense challenges the imagination and inventiveness of the translator. One must also avoid sounding like another Bible version. When copyrights and royalties are involved, translators must review not only Greek texts but also other versions in order to escape possible infringements. As more versions become available, translators are forced to be even more inventive. Notice how some translations attempt to remain literal, in sense, while implementing more expressive words. The second reason for choosing this verse is to discern if the translator has fully understood and captured the original significance of the question posed to Jesus, and His response to that question. Tribute - not taxation - is the issue here, and specifically the inscription on the coin. It is not a question of taxation but one of acknowledging national subjugation. Whereas taxation is anticipated for government services rendered, tribute means to acknowledge submission to a superior. Every individual in the Roman Empire was required to pay an annual tribute and to pledge, Caesar is Lord. Luke uses the Greek word PHOROS which he may believe to be synonymous with KENSOS that is used by Matthew and Mark in their parallel accounts. The political and spiritual dilemma for a devout Jew was more than just paying taxes to a foreign government in exchange for roads and bridges. It was a much deeper question, for this annual tribute was also a pledge of allegiance to the Caesar. Octavius (born Gaius Octavius Thurinus), known in the Bible as Caesar Augustus, initiated the issue by minting coins with this inscription: Caesar Augustus, Divi Filius, Pater Patriae, that is to say: Caesar Augustus, Son of God, Father of His Country. Augustus (Octavius at birth and Octavian when later adopted by Julius Caesar) was stating that he was a god, to be worshipped. That raised a few eyebrows even among Romans, but since he restored order to the Empire from the chaos that followed the assassination of Julius Caesar, people were generally content to accept this innovation. Whereas Julius Caesar might be considered the first dictator of the Roman Empire, Augustus definitely became its first Emperor. He was well liked and possessed a quality lacking in many rulers - grace. Succeeding Augustus was his adopted son Tiberius who subsequently minted on his coins: Caesar Augustus Tiberius, son of the Divine Augustus, which implied that since his father Augustus was divine, then he was divine also. Both men claimed to be God; Augustus by assertion and Tiberius by succession. 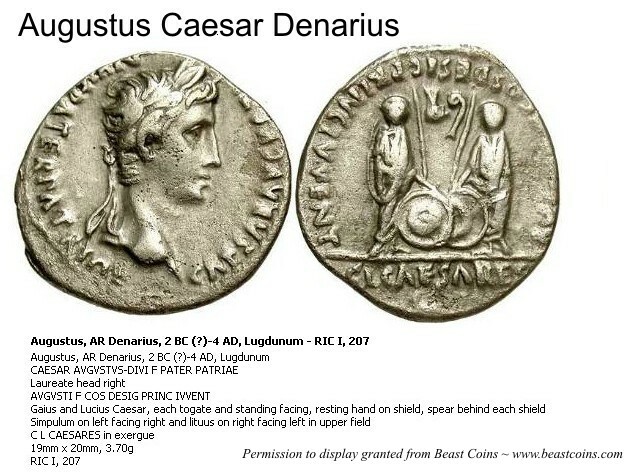 This forced public acknowledgement of allegiance was doubly blasphemous for Jews in that the coin (a denarius as shown at right) bore a graven image along with an inscription that claimed someone other than Jehovah was God. In other words, how could a Jehovah fearing Jew pay tribute and promise allegiance to an earthly ruler as his God? More pointedly is the real question: Who was the real God and protector of Israel: Jehovah? Tiberius? or Augustus? Tribute was a form of taxation, but the singular use of the word tax by Bible translators obscures the deeper question, and fails to account for the incredible amazement found in verse 26. Jesus' detractors were not asking if it was acceptable to pay taxes to a government for roads and bridges. They wanted to know where Jesus fit into the broad spectrum of political opinion regarding the permissibility of rendering godly allegiance to anyone other than Jehovah. This was a hot political issue for Jews. Of all the occasions and methods used to trap Jesus, this one was by far, the most clever. Similar attempts were usually trivial arguments over theology and their probable conclusions. For example, a woman that had seven husbands legally, ethically, and morally, thus, which one will she have in eternity? But on this occasion, the attempt was made to force Jesus into one of three political perspectives. No matter which one He picks, the other two will be against Him. He can't win! At least they believed so. There were three reactions to the tribute issue: Yes, No, and I guess we must. Notice again that a yes or no answer was requested. They wanted to box Jesus into the argumentative landscape of their own perspective. The more conservative voices (including the Zealots) emphatically said: No way. There is only one true God. Paying this tribute forces us to recognize a Caesar as God. The moderate voices were the Pharisees who said: We don't like it. We wish it were not the case. But what else can we do? The liberal voices were the Sadducees, the aristocrats who benefited immensely from Rome. They even tried to justify their political position by quoting passages such as Jeremiah 20:5, Moreover I will give all the riches of this city, and all its gains, and all the precious things of it, yes, all the treasures of the kings of Judah will I give into the hand of their enemies; and they shall make them a prey, and take them, and carry them to Babylon. Sadducees argued from this and similar passages that Rome was now the new Babylon. If God approved of Babylon manging the fate of Israel in the past then Rome might also possess this same blessing of Jehovah. It was a hotly contested issue which affected all Jews but at different social, economical, and theological levels. Only in the Gospel according to Luke do we find the words For Us which highlights that it was, indeed, a Jewish question - not a Gentile issue. Jesus exhibits a powerful display of wisdom by drawing attention to the image and the inscription of the coin itself where the Emperor is claiming to be God. In modern English (along with shameless commentary) Jesus might have said: If it's his inscription and his image and thus his coin and he demands to have it returned, then give it back to him - [ Because he is not God ] But, give to God [ Jehovah who really is God ] what belongs to God. In other words, if Caesar claims to be either God or a fig tree, that doesn't make it so. Jesus leaves his detractors in complete astonishment, as no one had thought of rejecting the underlying premise of the argument itself. This is not an issue of dutifully paying taxes for government services, because that woefully fails to explain their utter amazement in verse 26. They were amazed because Jesus identified the real issue of who is God! They never considered dismissing the underlying premise. And, what does belong to God? The earth is the Lord's and the fullness thereof, Psalm 24:1. That includes Caesar, his empire, and his tribute coin. 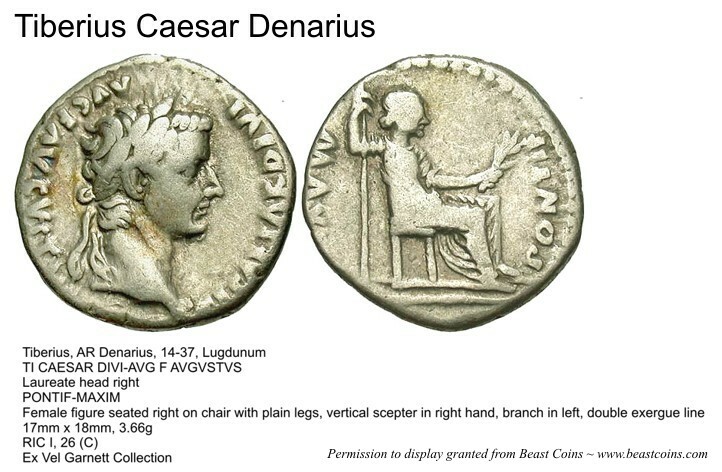 Other questions abound concerning this incident such as the continuing debate over which denarius was the tribute coin that was actually handed to Jesus. Although Tiberius was emperor at the time of this question and his coins had been minted for several years, the coins of Augustus had long saturated the Empire. Which coin do you think was given to Jesus: the first one of Augustus who started the whole issue, or the latter one of Tiberius who claimed the same status from his step-father? Six Caesars of the Tribute? Apostle Paul uses language at this point which is very flexible, permitting the translator to be inventive with vocabulary and creative with interpretation. More words permit the translator greater freedom to experiment with the nuances of language, and in this passage, there are several picturesque words that tempt the translator to cross the line from textual civility into personal opinion. Unlike the rigidity of the previous verse, the translator now finds room for expression. Paul's storm was extremely violent but the reference to a hurricane by a few translations is a bit presumptuous. Hurricanes are special types of cyclonic events that generally begin as tropical disturbances, as opposed to frontal activity or the convergence of mid-latitude systems. This writer has lived in Europe and traveled around the Mediterranean Sea from Spain to Israel, up the Adriatic and down the Dardanelles. He has a first hand understanding of this body of water, derived from personal experiences, local residents, and from one meteorological expert. Hurricanes (western hemisphere) and Typhoons (eastern hemisphere) are regional names for Tropical Cyclones (non-frontal synoptic scale low-pressure systems) which take many days to form, can last for weeks, and traveling several thousand miles. 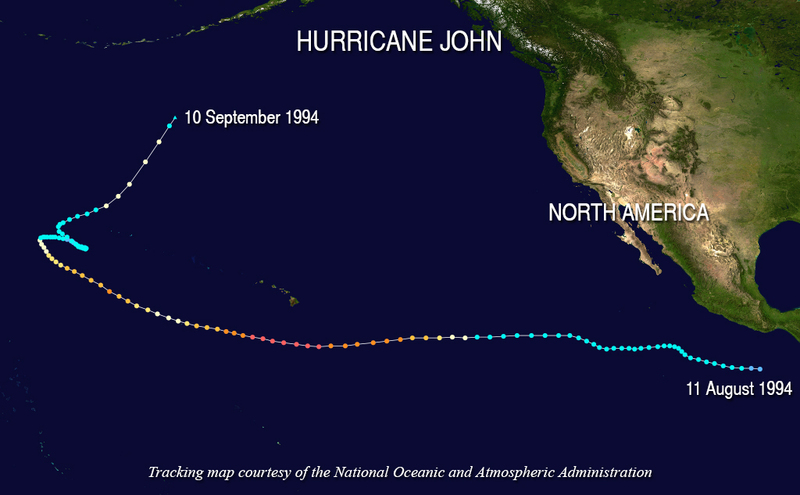 Hurricane John (1994) lasted 31 days over its track of 8,250 miles. 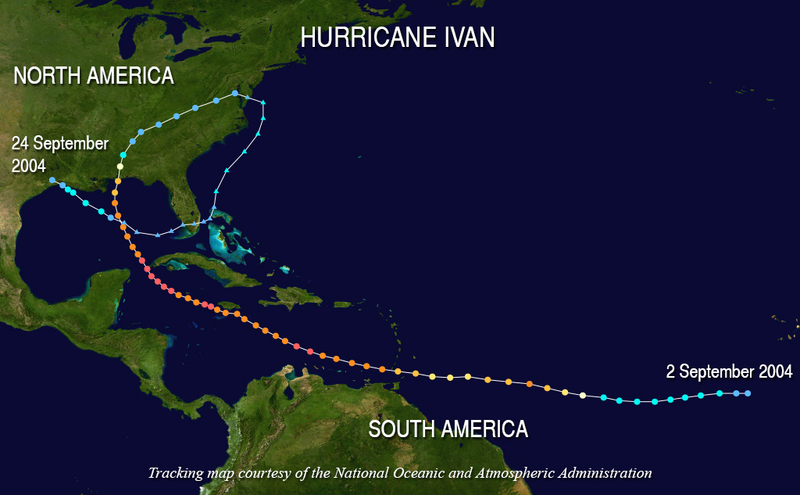 Hurricane Ivan (1994) lasted 22 days and traveled over seven thousand miles. 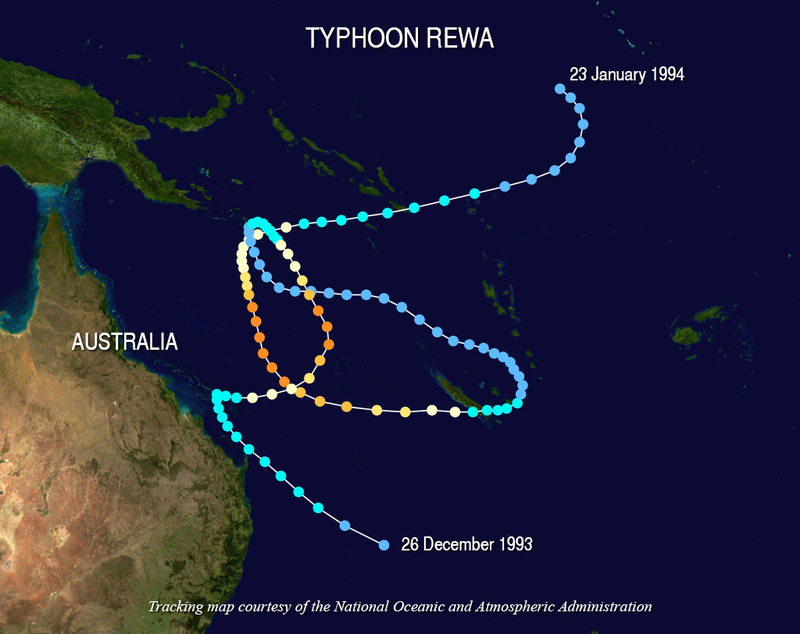 Typhoon Rewa (1994) lasted 28 days and traveled over five thousand miles. 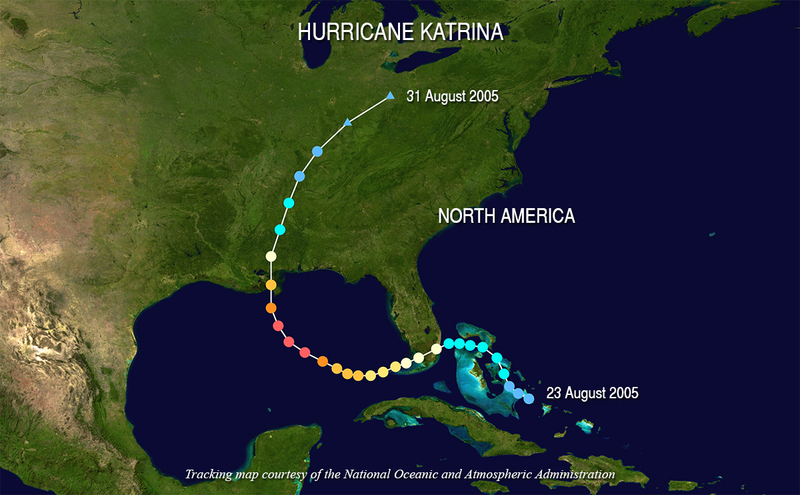 Hurricane Katrina (2005) lasted 8 days and traveled over two thousand miles. On the most rare occasions, small cyclonic systems have appeared in the Mediterranean but none have ever achieved Category 1 on the Saffir–Simpson Hurricane Wind Scale or Grade 12 on the Beaufort Wind Chart. Understandably, the Mediterranean Sea lacks the enormous amount of heat found at the equator where tropical depressions and inversion layers give birth to hurricanes. True hurricanes may die at the 37th latitude but they begin in the tropics. Just because a storm system has a spin does not validate it as a hurricane. Wind charts provide categories which serve to classify the volatility of a system. Basic requirements include ocean temperatures of no less than 26.5º C or 80º F over a vast area to no less that 150 feet with sufficient upper moist layers near the mid-troposphere. Tropical disturbances gradually build into tropical storms (39 mph) and eventually a hurricane, if able to maintain sustained surface winds of 74 mph. Climatic conditions around the Mediterranean lack the necessary foundational elements to create a hurricane. Violent mid-latitude storms occur in this region but it is extremely rare that they become cyclonic (spinning). The very few systems that have become cyclonic, appear only in the western section of the Mediterranean Sea, because there are too many land masses in the eastern sector which rob storms of their heat, the very ingredient necessary for storms to grow in strength. The Greek word ΤΥΦΩΝ (TYPHON) refers to the mythological god of storms and volcanic eruptions - not the spinning nature of the wind. Typhon was the youngest son of Gaia (earth) and Tartarus (underworld). 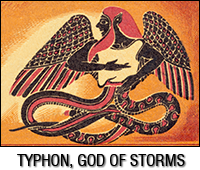 He is described by Hesiod as an incredibly powerful, huge winged monster with snake heads covering his shoulders, each breathing fire and hissing terrible noises. Above the waist he appeared human in form. Below his waist were coils of snakes. Fire flashed from his eyes. Typhon was the most violent and deadly creature in all of Greek mythology. He attempted to dethrone Zeus in order to achieve supremacy of the universe. The two were engaged in a fierce struggle. Zeus finally triumphed with his thunderbolts of lightning. Cyclonic (spinning) tropical wind storms in the eastern hemisphere (typhoons) were named after this ancient god of storms. Luke's reference to this tempestuous wind reflects its association with Typhon's strength. His name refers to the violent nature of the storm. It does not imply that it was a spinning typhoon or hurricane. Correct translation of Luke's storm narrative should emphasize violence, destruction, ferocity, turbulence, and strength. Apostle Paul and the Greek Island of Crete is a verse by verse account of Apostle Paul's journey which presents the most plausible explanation of the circumstances. Notice how the more literal translations avoided a description of the storm and the meteorological entanglements by simply transliterating the name. Additionally, some versions describe the wind beating against the ship while others describe the wind as coming from the island and some included the name of the island. New Testament Greek scholar A.T. Robertson, GRAMMAR, p. 606: AUTHES is in the ablative, not genitive case, beat down from it (island), not against it or on it (ship). AUTHES cannot refer to PLOION (boat) which is neuter. So the ablative case with KATA as in Mar 5:13. Some versions follow Robertson and some do not. A couple imaginatively tried to straddle both views. This verse offers more words to play with concerning an event that is filled with emotion, tension, and interpersonal dynamics. If the wind had not caught the boat, they would have wintered safely and the outcome of Paul's life may have been very different. At least the crew would not have acknowledged the superiority of Paul's God. This occasion is an example of God's sovereignty employed through ordinary and practical means. At first reading this verse appears to be literally demanding, yet it contains an irresistible enticement to be interpretively and theologically adventurous. One word has successfully tempted translators to suggest and invent circumstances which may or may not have occurred. Most of these words are literally exacting, thereby limiting interpretative freedom, except for that one word SKEOUS (vessel). It should be noticed that the majority of newer versions, delight in omitting manuscript words for the interjection of textually unsupported words. This rather nondescript word (vessel) allows the translator the opportunity to put something in it, and many did according to their preconceived theological dispositions. Some translators link the containers to the merchants, whereas others follow speculative history suggesting that Jesus' cleansing of the Temple also terminated a shortcut over the outer courts, whereby noisy travelers between the southwest (inner city) and northeast gates (Jericho road) could no longer disrupt God's house of prayer. A few translations put merchandise in the containers in order to firmly convict the Sellers, but then disappointingly fail to explain why the buyers were also expelled? What was their crime? How does one explain their ousting from the Temple grounds? It seems reasonable to conclude that both Sellers and Buyers were expelled for the same reason. No manuscript clearly states what was in the vessels, but that didn't stop many translators from guessing. The Greek preposition DIA means through and describes something being transported entirely across the Holy precincts, giving moderate weight to the suggestion (J.B. Phillips, Amplified, New English Bible) of a short-cut for travelers between the inner city and the Jericho Road by means of the southwest and northeast gates, and presumably a noisy and irreverent one at that. A.T. Robertson's Word Pictures of the New Testament: The temple authorities had prohibited using the outer court of the temple through the Precinct as a sort of short cut or by-path from the city to the Mount of Olives. But the rule was neglected and all sorts of irreverent conduct was going on that stirred the spirit of Jesus. Literal versions incorporate the pronoun but the more conversational versions supplant it with into which changes the focus more toward the Sellers. A pertinent question then arises: For what specific reason did Jesus cleanse the Temple? Was it because the merchants were cheating, a suggestion which fails to explain why the buyers were also expelled? Or was it because commercialism should not occur in a house of prayer? This makes better sense but it then intimidates modern church-goers who routinely conduct fund raising on church grounds. Have some translators focused entirely on the Sellers in order to alleviate concerns about bingo and bake sales? How many good sermons have you heard in the past twenty years concerning the sin of these buyers? How many Sunday School lessons have created good discussions about the transgressions of the buyers? Does it not raise curiosity with anyone that Jesus expelled the buyers for a reason? What was that reason? Speculation that the Sellers were cheating is unconvincing for these reasons: both Sellers and Buyers were ejected for the same infraction (cf. John 2:16), the quotation from Isaiah 56:7 identifies a spiritual problem, and the quotation from Jeremiah 7:11 has to do with spiritual robbery. None of these Old Testament quotations involved money. God was accusing recalcitrant worshippers in Jeremiah's time of robbing the Temple of its sacredness, for they were defiantly living immoral lives and yet trusting this Holy Place to expiate their guilt. Instead of true repentance lifting them up to God, their immorality was pulling the sacred nature of the Temple down to their level of depravity. A sacred place cannot replace the need for repentance, for God states this in the very next verse: But go ye now unto my place which was in Shiloh, where I set my name at the first, and see what I did to it for the wickedness of my people Israel - Jeremiah 7:12. In other words, Shiloh (first permanent resting place of the Tabernacle) did not previously save unrepentant worshippers and God is reminding them that Jerusalem is no better refuge. It is suggested by this writer that Jesus was making the very same charge and appropriately used this verse as His defense for removing Sellers AND Buyers who were both guilty of the same spiritual infraction. Thus, even a preposition can dramatically influence interpretation. Translations are ranked according to the above three verses, not comparatively to each other as a whole because this exercise is predicated entirely on the tendency of the translator to depart from the underlying manuscript text on such occasions as described above. An exercise determined from "soft-ball" verses would exhibit similarities so great as to nullify the differences that actually exist between various translations. It is "hard-ball" verses such as those described above that extract the true proclivity of the translator, for here even the literal translator is tempted to lean toward interpretation. Predictably, most literal versions eschewed the temptation to exhibit opinions while non-literals relished the opportunity. There were a few normally more literal versions that succumbed to these very tendencies and thus placed lower on the list than would otherwise be expected. When two or more Versions yielded the same Final result, they were then ordered by their Subtotals. If two or more Versions still yielded the same Subtotal, they were then sub-ordered by those which had the least Insertions, Omissions, or Opinions. Ranking is entirely predicated on literalness - not accuracy. A position near the top does not necessarily mean good any more than bad should be associated with those at the bottom. Translations known for their literalness naturally placed near the top of the list and those known for interlacing opinions and commentary placed near the bottom. Most disagreements with our exercise will probably involve those several versions that placed in the middle, to which application of different verses might bump them up a few levels. However, rising a few levels does not significantly enhance the overall character of any translation, and appealing to other verses will certainly not transform a Paraphrase into a Literal nor a Literal into a Paraphrase. A perfect score of 48 was nearly achieved by a few translations. Minus scores for others were the direct result of a predilection for opinion and interpretation over literalness. It must be stated that infrequently an opinion may actually enhance comprehension to a limited degree. But since this exercise is occupied only with ranking translations according to literalness, the existence of omissions, insertions, and opinions are a detriment. In Acts 27:14, the wind factor DOWN FROM (the island) and AGAINST (the ship) are both counted as Literal, even though A.T. Robertson references have excused the appearance of the word Literal. We wanted to illustrate how differently translators understand the same text, in spite of grammar, scholarly research, or etymological issues. Check out our own Grammatical Analysis where each word of each verse has been individually parsed, translated, and modestly explained, so that you will have a commanding understanding of the underlying text as you study the following translations. This interlinear approach gives you a nice advantage without requiring you to be a linguistic expert. There are also links to this resource appearing just below each translation entry at the right margin, so that you may quickly and frequently make reference without scrolling and losing your place. The central issue is whether God's free born people should be required to give or yield allegiance through "tribute" to an emperor who says that he is god. Only Luke records "for us" which emphasizes this point. It was not a payment for goods or services, or the maintenance of roads and bridges. The presentation of the coin demonstrated ones loyalty to the emperor. LITERAL words similar to: Permissible, Allow, Right, Tribute, For Us, Give, Yield, Caesar. A special legendary, unannounced, violent wind interrupted a soft southerly breeze that surprised the crew and blew the ship away from the safety of the island toward a seaborne uncertainty. LITERAL words similar to: Not Long After, Violent, Tempestuous, Fierce, Against Us, Down From, Euroclydon or Euraquilo or Northeaster, (but not both of the latter two). Several NT authorities (Robertson, Gill) believe that Temple officials had prohibited using the outer court as a short cut for travelers between the Jericho Road and the inner city. But, laxity over the years allowed common or non-spiritual activities to prevail. LITERAL words similar to: Any, Anyone, Any Person, Would Not, Not Allow, Not Permit, Prohibited, Carry, Bare, Vessel, Container, Through, Temple. Courts and courtyards were not counted as Insertions because the Temple was a network of courtyards within courtyards. Is it right that we should pay tribute to Caesar, or not? But it was not long before a gale of wind struck the ship, the wind called Euraquilo. Nor would he allow anyone to carry his wares through the temple. Is it lawful for us to give tribute to Caesar, or not? And not much after, a stormy wind being called Euroclydon beat down on it. And He did not allow any to carry a vessel through the temple. Is it lawful for us to give tribute unto Caesar, or not? But after no long time there beat down from it a tempestuous wind, which is called Euraquilo. And he would not suffer that any man should carry a vessel through the temple. Is it lawful for us to pay taxes to Caesar or not? But not long afterwards, a fierce wind called the "northeaster" rushed down from the island. ...and would not permit anyone to carry goods through the temple complex. Is it permissible for us to pay the tribute tax to Caesar, or not? But not long after, there arose against it a tempestuous northeast wind, called Euraclydon. He did not allow anyone to carry stuff through the temple courts. Is it lawful for us to give tribute unto Caesar, or no? But not long after there arose against it a tempestuous wind, called Euroclydon. And would not suffer that any man should carry any vessel through the temple. Is it lawful to us to give tribute to Caesar or not? ...and not long after there arose against it a tempestuous wind, that is called Euroclydon. ...and he did not suffer that any might bear a vessel through the temple. Is it lawful for us to give tribute unto Caesar or no? But not long after, there arose against it a tempestuous wind, called Euroclydon. And He would not suffer that any man should carry any vessel through the temple. Is it lawful for us to pay taxes to Caesar, or not? But before very long there rushed down from the land a violent wind, called Euraquilo. and He would not permit anyone to carry merchandise through the temple. Is it lawful for us to give tribute to Caesar, or not? But soon a tempestuous wind, called the northeaster, struck down from the land. ...and he would not allow any one to carry anything through the temple. Is it lawful for us to pay taxes to Caesar, or not? But after no long time there beat down from it a tempestuous wind, which is called Euroclydon. He would not allow anyone to carry a container through the temple. Tell us, is it right for us to pay taxes to Caesar or not? But then a very strong wind named the "northeaster" came from the island. 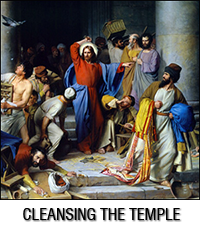 Jesus refused to allow anyone to carry goods through the Temple courts. Is it lawful for us to pay taxes to Caesar or not? But it was not long before a violent wind (called a northeaster) swept down from the island. He wouldn't even let anyone carry a vessel through the temple. Is it lawful for us to give tribute to Caesar, or not? But soon a tempestuous wind, called the northeaster, struck down from the land. And he would not allow anyone to carry anything through the temple. Are we or are we not permitted to pay taxes to the Roman Emperor? But before very long a fierce wind, the 'Northeaster' as they call it, tore down from the landward side. ...and he would not allow anyone to use the temple court as a thoroughfare for carrying goods. Is it lawful for us to give tribute to Caesar or not? But soon afterward a violent wind [of the character of a typhoon] called a northeaster, came bursting down from the island. And He would not permit anyone to carry any household equipment through the temple enclosure [thus making the temple area a short-cut traffic lane]. Is it right for us to make payment of taxes to Caesar or not? But after a little time, a very violent wind, named Euraquilo, came down from it with great force. And he would not let any man take a vessel through the Temple. Is it right for us to pay taxes to Caesar or not? And not long after, a stormy head wind rushed down from it, called Northeaster. And He did not allow anyone to carry a vessel through the Set-apart Place. Is it mutar (permissible) for us to pay tax to Caesar or not? After not much time a violent, typhoon force wind rushed down from Crete, the so called Euraquilo, the Northeaster. And he was not allowing anyone to carry things through the Beis HaMikdash (temple). National Council of the Churches of Christ, Washington, D.C.
Is it lawful for us to pay taxes to the emperor, or not? But soon a violent wind, called the northeaster, rushed down from Crete. And he would not allow anyone to carry anything through the temple. Is it lawful that we should give a tribute to Caesar, or not? But after not much time a violent wind rushed down from it, the one being called the Northeaster. ...and He was not permitting that anyone carry an object through the temple. Is it lawful for us to give tribute to Caesar, or not? But not long after there came down it a hurricane called Euroclydon. ...and suffered not that any one should carry any package through the temple. Note: This version is included for comparison purposes only. The publishing body has never divulged the names of the translation committee or their textual methodology. Additionally, some readings concerning the deity of Jesus are considered questionable by a large segment of mainline Christian denominations. Therefore, inclusion does not imply endorsement. Is it lawful for us to pay head tax to Caesar or not? After a short time, however, a violent wind called Euroaquilo rushed down on it. ...and he would not let anyone carry a utensil through the temple. Tell us, is it against our Law for us to pay taxes to the Roman Emperor, or not? But soon a very strong wind--the one called "Northeaster"--blew down from the island. ...and would not let anyone carry anything through the temple courts. Is it lawful for us to pay taxes to Caesar or not? But not long after, a tempestuous head wind arose, called Euroclydon. And He would not allow anyone to carry wares through the temple. Is it lawful for us to pay taxes to Caesar, or not? But not long afterward there beat down from the island a hurricane wind called Euraquilo. And He would not let anyone carry a vessel through the temple. Is it right for us to pay tribute to Caesar or not? Presently down rushed a hurricane of a wind called Euroclydon. ...and would not allow anyone to carry a vessel through the temple. Is it right for us to pay taxes to Caesar or not? Before very long, a wind of hurricane force, called the "Northeaster," swept down from the island. ...and would not allow anyone to carry merchandise through the temple courts. Is it permissible for us to pay taxes to Caesar or not? But it was not long before a hurricane, the "northeaster" as they call it, burst on them from across the island. Nor would he allow anyone to carry anything through the Temple. Are we permitted to pay a tax to Caesar or not? Now, after no long time there beat down from it [mountainous Crete] a wind of typhoon proportions which is called Euraquilo. ...and was not permitting anyone to carry household gear through the temple. Is it lawful for us to pay the tribute tax to Caesar, or not? Not long after this, a hurricane-force wind called the northeaster blew down from the island. ...and he would not permit anyone to carry merchandise through the temple courts. Tell us, should we pay taxes to the Emperor or not? But soon a strong wind called the "northeaster" blew against us from the island. Jesus would not let anyone carry things through the temple. Now, is it right for us to pay taxes to Caesar or not? But before long a terrific gale, which they called a north-easter, swept down upon us. ...and he would not allow anyone to make a short cut through the Temple when carrying such things as water-pots. Is it allowable to pay a tax to Caesar, or not? But it was not long before a furious north-east wind, coming down from the mountains, burst upon us and carried the ship out of her course. ...and would not allow any one to carry anything through the Temple. Is it allowed us to give a tax to Caesar, or not? Now not much after, a wind, a hurricane, called a "northeaster," casts itself against the island. And He did not give leave that anyone may be carrying a vessel through the sanctuary. Is it lawful for us to pay tribute to Caesar or not? Before long an offshore wind of hurricane force called a "Northeaster" struck. He did not permit anyone to carry anything through the temple area. So is it legal to pay taxes to Caesar, or not? Not long after, a wind of hurricane force called the "Northeaster" tore down from the island. He wouldn't let anyone carry merchandise through the temple. So — is it lawful for us to pay taxes to Caesar's occupying regime, or should we refuse? Then things got scary. A violent northeaster, the Euraquilo, blew down across Crete. He physically prevented anyone from carrying anything through the temple. Tell us: Is it lawful to pay taxes to Caesar or not? But they were no sooner out to sea than a gale-force wind, the infamous nor'easter, struck. He didn't let anyone even carry a basket through the Temple. Is it rightful that we pay Caesar the head tax or not? And after a short while, a hurricane broke out against us, which is called Euroclydon's Typhoon. And he did not allow a single one of them to re-enter the temple. Now tell us -- is it right to pay taxes to the Roman government or not? 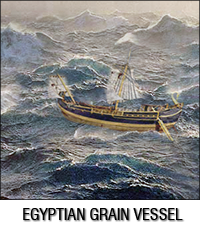 But the weather changed abruptly, and a wind of typhoon strength (a "northeaster," they called it) caught the ship and blew it out to sea. ...and he stopped everyone from bringing in merchandise. Now tell us -- is it right to pay taxes to the Roman government or not? But shortly afterwards, the weather changed abruptly and a heavy wind of typhoon strength (a "northeaster," they called it) caught the ship and blew it out to sea. ...and stopped everyone from bringing in loads of merchandise.